Permanent Capital - The amount invested by equity shareholders is permanent capital for the business. It is not repayable to the equity shareholders during the tenure of the company. The capital is to be repaid by the company only in the event of the winding up of the company. So equity provides a permanent/long-term capital to the organization. Rights of Equity Shareholders - Equity shareholders enjoy the certain rights. They have a right to get a share of profit. The share in profit, which is distributed to the equity shareholders, is called dividend. Thus, equity shareholders have a right to get a share of profit of the company. Equity shareholders also have the right to vote. They have a right to vote and elect the board of directors of the company. The board of directors of the company runs the business on behalf of the equity shareholders. They also have a right to vote for the amendment of the memorandum as well as articles of association. Equity shareholders are the owners of the company and hence they have the right to inspect the books of accounts of the company anytime. They also have the right to transfer their shares. Equity share capital is not repayable during the tenure of the company. The capital of equities is paid back only at the time of winding up of the company. However, if any shareholder wants to transfer his shares, he can do so. This right to transfer the share is one of the most important rights of the shareholders. No fixed dividend - Every equity shareholder has a right to receive a share in the profits of the company. His share in the profit of the company is called as the dividend. However, this dividend is not fixed. This dividend is not provided at a fixed rate to the shareholders. The dividend paid to equity shareholders depends upon the profit of the company. If the company makes good profits, then equity shareholders get good dividends. However, if the company doesn't make any profit or makes very less profit, chances are that equity shareholders may not even get the dividend. So the dividend amount is very fluctuating in nature. Thus, the returns that equity shareholders get on their investment in the company are fluctuating in nature. No Preferential Rights - Equity shareholders do not have any preferential rights, unlike preference shares. In the case of preference shares, the dividend is fixed and is paid before the dividend is paid to the equity shareholders. Equity shareholders are the last to receive the dividend. Out of the profits made by the company, the company first pays interest on external loans. So the interest on external loans is first paid. After that the dividend is paid on the preference shares and only after that, the equity shareholders get the dividend. So if no profit is left after giving the dividend to preference shareholders, then equity shareholders won't get any dividend Similarly, at that time of winding up of the company, the proceeds received from the sale of assets of the company are first used to pay off the external liabilities. Once the external liabilities are paid, then the preference share capital is repaid. Once the amount has been repaid to preference shareholders, after that the equity shareholders can get their capital. Thus, equity shareholders are the last when it comes to payment of the dividend or when it comes to repayment of the capital at the time of the winding up of the company. Risk Takers - Equity shareholders are the ones who take the maximum risk in the company. The dividend to equity shareholders is paid at the last (after repayment of interest on external liabilities and after paying the dividend to preference shareholders). Similarly, the capital repayment also happens at the last to equity shareholders. At the time of closure of the business, the amount received by selling the assets of the company is first used to repay the external liabilities. Then the repayment of preference share capital is made and only after that equity shareholders can get their capital. Thus, they are the true risk bearers of the company. Control of the Company - Equity shareholders control the company. The control of the company lies in the hands of equity shareholders. This is because they have the right to vote. They have the right to elect the Board of Directors who control/manage the company on behalf of equity shareholders. Thus, equity shareholders are the ones who have control over the company. Residual Claimants - Equity shareholders are residual claimants. This is because the dividend is paid to equity shareholders only after the interest of all external liabilities is paid and after the preference dividend has been given. The profits of the company are first utilized to pay off interest on all external loans/liabilities and then it is utilized to pay off the dividend of the preference shares and the dividend to equity shareholders is paid only out of the remaining amount. Again in the case of winding up of the company, they are the last one to receive the payment. In the case of winding up or closure of the company, the amount received by the company by selling off its assets is first utilized to pay off all outside liabilities/outside loans. Then the amount is paid to preference shareholders and if there is anything left after paying off the preference shareholders, then the remaining among is paid to the equity shareholders. Thus, they are the residual claimants in the company. Eligibility for Bonus or Rights issue - The equity shareholders are eligible to get bonus shares and rights shares. 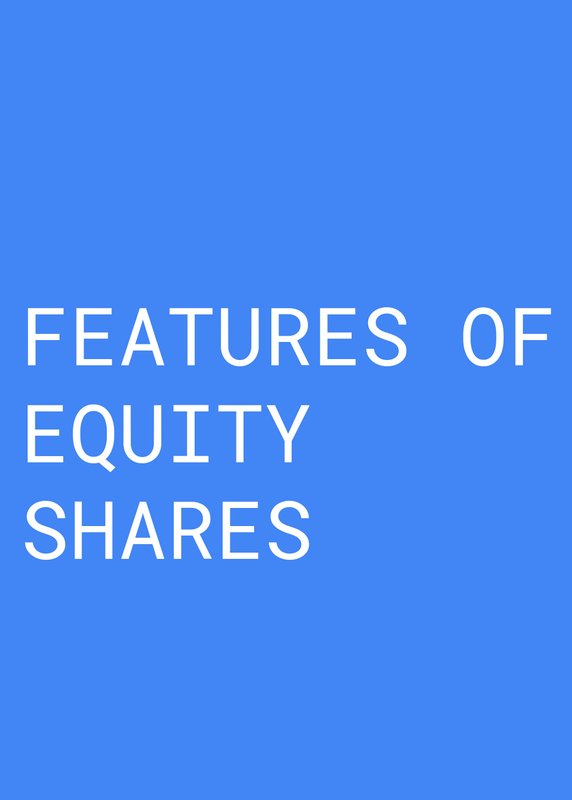 Bonus shares are the shares which are given to equity shareholders by the company out of the profits accumulated by the company. Bonus shares are given free of cost. Generally, the profit made by the company is not completely distributed among the equity shareholders as a dividend. Generally, a part of the profit is kept aside by the company and only a part of the profit is distributed as a dividend to the equity shareholders. The bonus shares are given free of cost to equity shareholders out of these accumulated profits. The profits which company accumulates over the period of time is utilized to give bonus shares to the existing shareholders. Equity shareholders also get the benefit of the rights issue.